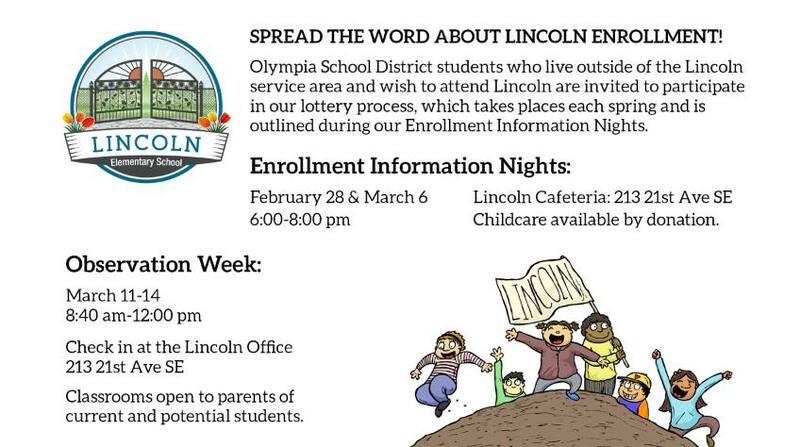 Families in the Lincoln Service Area* and siblings of current students are guaranteed access to the Options Program at Lincoln School. We also welcome new families in the Olympia School District residing outside the Lincoln Service Area who are interested in an alternative program. A lottery, which takes place in the spring, determines the priority for enrolling new students. Attendance at a Lincoln Information Night is recommended for all potential students and required for out of service area students. Children must be five years old on or before August 31 to attend kindergarten and participate in the lottery. Out of service area families who are offered a position through the lottery will be asked to provide proof of residency prior to enrollment. Siblings of students currently enrolled must be living in the same household to be eligible for participation in the lottery. Out of service area siblings must begin the program in Kindergarten, or they will need to go through the lottery for enrollment in grades 1 through 5. We invite you to attend Enrollment Information Nights (attendance at an enrollment information night is required to participate in the lottery) and Observation Week in March and to complete a program application. For more information about the Options Program and enrollment information, please call Curt & Mollie Gavigan at (360) 870-0219. *More information about district service areas can be found on the Olympia School District Website.